This posting originally appeared on the Society for U.S. Intellectual History’s blog. Kennan’s predecessors on the ground in Russia during the upheaval did not view Reed as kindly. On New Year’s Eve, 1918 – when the US and Bolshevik government in Russia maintained fraught relations – US Ambassador David Francis wrote to Secretary of State Robert Lansing that he was “endeavoring… to get Lenin to revoke Reed appoint [as Soviet consul in New York] with fair prospect of success.” After Reed returned to the United States in April 1918, federal authorities seized his impressive archive of Soviet newspapers, circulars, published speeches and proceedings, and posted proclamations –upon which Ten Days That Shook the World would ultimately be largely based upon. Despite promising that Reed’s archive would be returned to him the next day, US authorities held it for over six months. 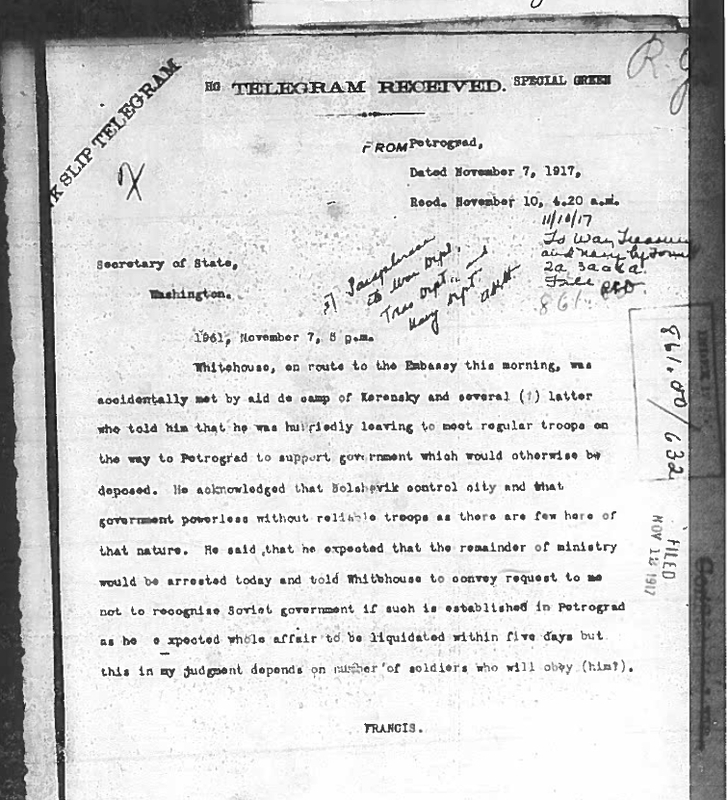 The US government’s ultimately successful effort to remove Reed as the Soviet’s representative in the US is the only time that his name is mentioned in the State Department’s Foreign Relations of the United States volume on the Russian Revolution.2 But although he is largely absent from the official, US-government-published diplomatic history of US-Russian relations, Reed’s descriptions of “‘Red Petrograd,’ the capital and heart of the insurrection” enhance and amplify the diplomatic accounts of the Revolution. In fact, the two accounts – of drastically differing prose –complement each other extraordinarily well. At Smolny 4 [a former convent at the edge of the city that was the intellectual and tactical headquarters of the uprising] there were strict guards at the door and outer gates, demanding everybody’s pass. The committee-rooms buzzed and hummed all day and all night, hundreds of soldiers and workmen slept on the floor, wherever they could find room. Upstairs in the great hall a thousand people crowded to the uproarious sessions of the Petrograd Soviet. Both the State Department dispatches and Reed’s Ten Days (and I eagerly hope that my esteemed roundtablists have been able to identify which, exactly, were the ten days that Reed chronicled; I could not) seem to identify three key points which led to the success of the Bolsheviks: 1) The conversion and alliance of the Petrograd garrison and its 60,000 soldiers to the Bolshevik cause, 2) The successful – if surprisingly easy – “storming” of the Winter Palace, and 3) the decision of the railroad workers union not to transport Kerensky and his army to Petrograd to put down the revolution. ‘The Petrograd garrison no longer recognizes the Provisional Government. The Petrograd Soviet is our Government. We will obey only the orders of the Petrograd Soviet, through the Military Revolutionary Committee [controlled by the Bolsheviks].’ The local military units were ordered to wait for instructions from the Soldiers’ Section of the Petrograd Soviet. Press reports great majority of soldiers in Petrograd garrison have passed resolutions to obey Soviet if demonstration ordered. Right young men from officer’s military school just arrived Embassy saying ordered here by Petrograd staff to protect Embassy and guards sent to all foreign missions. Think this not significant but merely precaution. In fact, the situation in Petrograd was well past the stage of precaution. Too late. 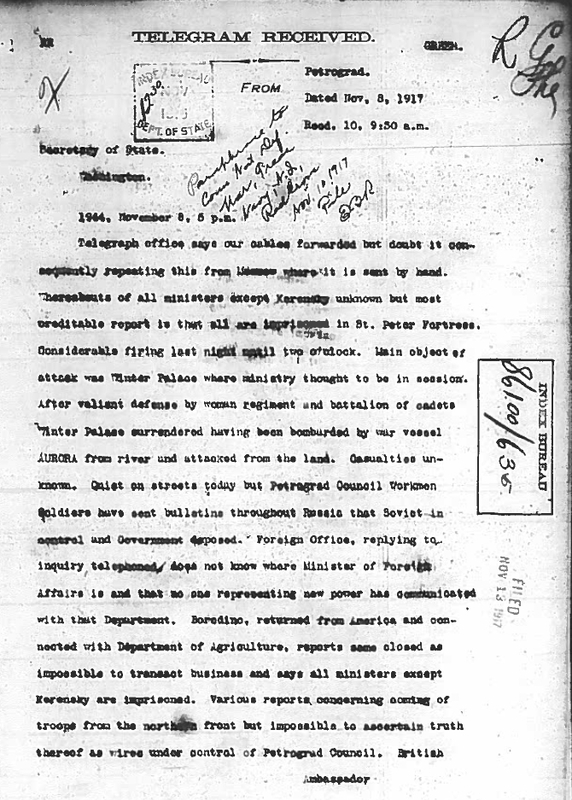 Department of State dispatch, November 7. Because of the possibility of telegraphic communication between our Embassy in Russia and the Department being interrupted due to latest developments in Petrograd, I am sending the following which appear in the press this morning as dispatches from the Russian official telegram bureau. 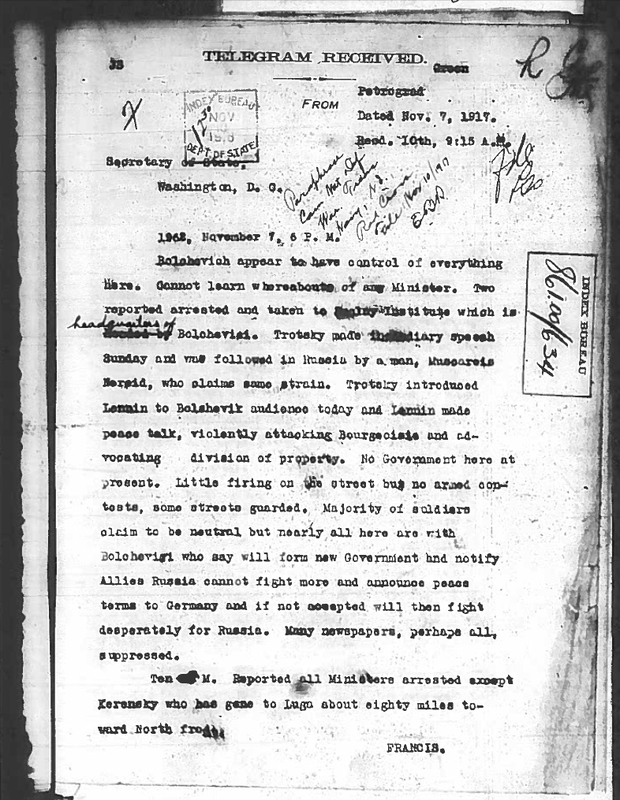 According to these telegrams Bolsheviks have made successful coup d’état; have taken the State Bank, telegraphs, telegram bureau and have arrested certain members of Kerensky’s government. At the end of the corridor was a large, ornate room with gilded cornices and enormous crystal lustres, and beyond it several smaller ones, wainscoted with dark wood. On both sides of the parquetted floor lay rows of dirty mattresses and blankets, upon which occasional soldiers were stretched out; everywhere was a litter of cigarette-butts, bits of bread, cloth, and empty bottles with expensive French labels. More and more soldiers, with the red shoulder-straps of the yunker schools [military academies], moved about in a stale atmosphere of tobacco-smoke and unwashed humanity. One had a bottle of white Burgundy, evidently filched from the cellars of the Palace. Reed more precisely reported the nuance of the Vikzhel’s position.9 In addition to helping the Bolsheviks by halting Kerensky’s advance, it was also harming them by not allowing food or other goods into the city. Reed describes that the railway workers union halted transportation to exercise its political power – its spokesperson described the union as “the strongest organization in Russian” – and an attempt to gain larger representation in the new revolutionary government. Nonetheless, as the Vikzhel tried to use its power to forge “a government based on the confidence of all the democracy,” Kerensky had lost the railways, and his ability to retake Petrograd. The Bolsheviks would hold the city for 74 years. It is a pity that the American diplomats in Russia during the revolution could not read Reed’s reporting in real time; their understanding of the upheaval would have been much fortified. Nevertheless, the State Department’s accurate – if colorless – reporting to Washington was ultimately proven more correct than Reed’s on two of the largest questions of the Russian revolution. The first: the terror. Reed openly acknowledges that he did not attempt to chronicle the revolution as an impartial observer. “Adventure it was,” he wrote in his preface, “and one of the most marvelous mankind ever embarked upon.” But as he chronicled this adventure, he could not help but document the ominous signs of the terror that accompanied it. But here, unlike elsewhere, Reed does not editorialize. Instead he quickly transitions to an exciting tale of accepting a workman’s offer to jump into a motor truck “bumping at top speed down Suvorovsky Prospect” to the Winter Palace and crowds that had gathered around it. In a later instance, Reed, writing as a correspondent for the socialist paper The Masses, serves as loyal stenographer to Lenin. The leader of the new revolutionary government, “each sentence falling like a hammer-blow,” declared the end of the free press. Lenin explained that “to tolerate the bourgeois newspapers would mean to cease being a Socialist.” Reed, again without editorializing, dutifully reports that on November 17, 1917 the free press in Russia was abolished by a vote of 34 to 24. Department of State dispatch, November 8. The American diplomats were far more concerned with the implications of Soviet Russia making a separate peace with Germany and ending the war on the Eastern front than with the Petrograd Revolution spreading to the American masses. Gompers wrote: “That we regard it as untimely and inappropriate, conducive to no good result, but on the contrary harmful, to hold an international conference at this time or in the near future with the representatives of all countries, including enemy countries, and we are constrained therefore to decline at this time either to participate in or to call such a conference.” American diplomats correctly ascertained that despite the genuine grievances and unrest of their working classes, there was little risk of the White House succumbing to the fate of the Winter Palace. So. Lenin and the Petrograd workers had decided on insurrection, the Petrograd Soviet had overthrown the Provisional Government, and thrust the coup d’etat upon the Congress of Soviets. Now there was all great Russia to win—and then the world! Would Russia follow and rise? And the world—what of it? Would the peoples answer and rise, a red world-tide? Three years later, Reed died of typhus in Moscow and was buried under the Kremlin wall necropolis. The answer to his question would have devastated him.